A fault is a crack or fracture in Earth's crust caused by the movement of landmasses, called plates, on either side of the fault line. Faults are found either at the surface (fault surface) or underground (fault plane). Most earthquakes occur along fault lines. The principle types of faults are: normal, reverse, thrust, and slip-strike. Normal faults form when two plates are under tension and are being pulled or stretched apart. When this occurs, Earth's crust thins and one plate rises or drops against the other. More than 200 million years ago, North America and Africa were one huge landmass. Plates on either side of a massive fault line ruptured and began drifting apart. Oceanic waters, now known as the Atlantic Ocean, surged into the valley between, and two separate continents were born. Thrust faults are low-angled reverse faults. Such faults are noteworthy because they produce great horizontal movement. Thrust faults have created most of the great mountain chains found around the world. 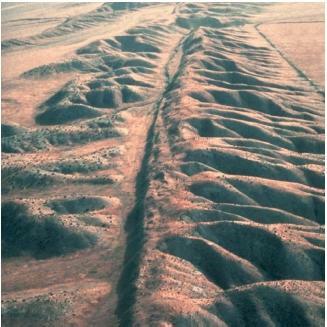 Strike-slip faults move horizontally along the fault line. The edge of one plate grinds against the edge of the other as it slips sideways. Most of these movements are quiet and continuous. Sometimes, however, plates shift with a sudden lurch, causing earthquakes. Such is the case with the San Andreas Fault in the western United States where the North American and Pacific plates meet. Land west of this fault is edging northwest. Does anyone know if you can actually destroy california by placing a nuclear explosion along the fault line? I'm watching an old Superman flick and my curisity has been raised. If anyone knows can they email me please? Very Helpfull Site for Geology Students and aslo for Geologists. This web site is pretty cool. You give alittle more informations about related material.